Above: An artist’s illustration shows two neutron stars colliding and merging with each other, sending out clouds of material and long bursts of gamma rays. The grid represents space-time being warped by gravitational waves from the collision. When she saw her colleague's message on her screen, a single exclamation point, Maria Drout knew their team had struck cosmic gold. It was Aug. 17 and the group of astronomers was one of at least half a dozen teams that were, at that same moment, racing to find a distant explosion that was under way out there in the universe, somewhere. In the end, it only took a few minutes of examining a handful of target galaxies to locate the telltale glow they were after: It would be the first direct sighting of a kilonova, a chaotic explosion caused by two extraordinarily dense objects known as neutron stars colliding and splattering hot nuclear debris into space. "I was kind of in shock because I wasn't expecting us to find it that quickly," said Dr. Drout, an astrophysicist based at the University of Toronto's Dunlap Institute. "It wasn't supposed to be this easy." The result has offered a dramatic glimpse at Mother Nature as alchemist. For 20 years, theorists have conjectured that atoms of gold, platinum and other rare metals are produced in such collisions. Now we know this idea is correct and it means the raw material from which our own solar system formed must have been seeded by one or more such events to explain the precious metals we have here on Earth. Yet, that's just one of the discoveries to flow from an unprecedented observation. It has also solved the mystery of short gamma ray bursts, high-energy flashes that are sometimes sensed by orbiting satellites but that are too brief to identify. And it may go down as the first time astronomers have watched the birth of a new black hole in real time – although this has yet to be confirmed. "This is a revolution in astronomy, there's no other word to describe it," said Vicky Kalogera, a professor at Northwestern University near Chicago and a senior astrophysicist with the Laser Interferometer Gravitational Observatory, known as LIGO, the experiment that made the historic detection possible. Three gravitational wave detectors, one based in Italy and two in the United States, together helped telescopes around the world and in space spot and study the event. LIGO's twin detectors, one in Washington State and one in Louisiana, use laser light reflecting back and forth down four-kilometre-long tunnels to pick up the momentary distortions that ripple the fabric of space whenever massive objects in the distant cosmos are accelerated with unimaginable force. Starting last year, LIGO began making headlines for detecting collisions of black holes, which give off no light. Earlier this month, that success earned the three surviving researchers who were most responsible for developing LIGO over the past three decades the Nobel Prize in Physics. But the experiment had never detected anything that astronomers could hope to see. All of that changed two months ago, when LIGO's sensitive detectors were jiggled for 100 seconds by the far-away collision of two neutron stars. Each neutron star is a compact ball of nuclear matter measuring only about 10 kilometres across and carrying more mass than our entire sun. They are the remnant cores of a pair of former giant stars that exhausted their fuel billions of years ago and then destroyed themselves in back-to-back supernova explosions. 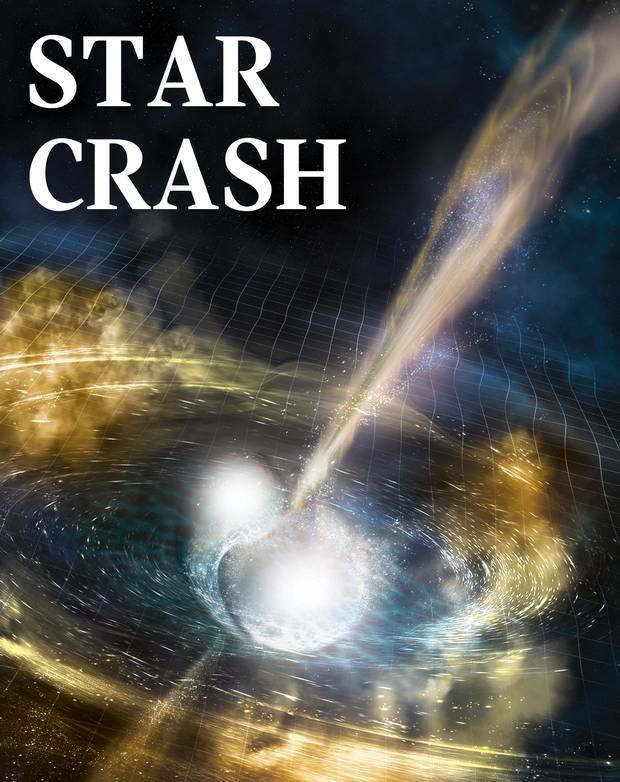 Scientists have detected ripples of gravity caused by the violent collision of two neutron stars, among the densest objects in the known universe. The gravitational signal allowed astronomers to quickly pinpoint where in the sky to direct their telescopes to witness the ensuing explosion. In spiral: Two neutrons stars, each the remnant of a supernova explosion, orbit one another. Their rapid motion generates gravitational waves causing them to lose energy and converge. Merger: As they draw nearer, the rapidly spinning surfaces of the neutron stars collide, spewing superdense material into space while the stars merge and possibly form a black hole. Kilonova: The material thrown from the collision forms an explosive wreath of hot, dense nuclear matter. The material generates an intense glow called a “kilonova” that is seen on Earth. While the gravitational energy of two such objects colliding is not quite as jarring as a merger of black holes, the event was much closer than anything LIGO has detected before – about 130 million light years away based on the force of the vibration – so the resulting signal was unmistakable. "It was a very strong signal from their end and they let us know that right away," said Dr. Drout, who was visiting with colleagues at the Carnegie Institution in Pasadena, Calif., when the alert came in. She instantly flung herself into the high-stakes treasure hunt to try to spot the resulting explosion and start gathering precious data as early as possible. Meanwhile, several other teams also notified by the alert were doing the same. Fortunately for the astronomers, LIGO was this year joined by a third detector, called Virgo, based in Italy. Because all three locations felt the collision, the slight difference in the signal's arrival time at each detector allowed scientists to triangulate back to the region of the sky in the southern hemisphere where the explosion occurred. One of the telescopes the Carnegie group routinely uses to image supernovas is located atop Las Campanas in Chile, so Dr. Drout knew that she and her collaborators would be among the first to have a crack at spotting the kilonova as soon as the sun set. However, because of the Earth's rotation, the opportunity would last only a short time. "We were only going to have about an hour to frantically search for any optical counterpart," she said. The team spent the afternoon rapidly compiling a list of more than 100 galaxies in the target region where the collision could have taken place. Once the sky was dark enough, the telescope was put into action, rapidly acquiring images the astronomers looked at by eye and compared with reference photos to see whether anything looked out of the ordinary before moving on. "It was very old school," she said. "We thought we could be faster that way." The strategy worked. Within 10 minutes and less than 10 galaxies into their search, her teammate in Santa Cruz who was also skyping in with the observatory spotted what seemed to be a new star on the edge of NGC 4993, a galaxy located in the direction of the constellation of Hydra. It was the first kilonova ever identified and the first light to be directly linked to a gravitational-wave detection. The discovery has preoccupied a significant share of the world's professional astronomers ever since but was only made public on Monday, in conjunction with the release of an avalanche of scientific papers detailing co-ordinated observations of the event. One paper alone has more than 4,000 authors representing more than 900 universities and research institutions around the globe, Dr. Kalogera said. "It's been exhilarating," she added. "None of us has ever come close to anything like this experience." The complex nature of the high-energy explosion makes it difficult to assess exactly what happened to the merging neutron stars at its centre. The LIGO team says it is still analyzing the final milliseconds of the gravitational signal to see whether the colliding stars simply produced a more massive neutron star or collapsed out of existence to form a black hole. A nine-day delay in the emergence of X-rays from the kilonova may indicate that a black hole is likely. In that case, the X-rays are coming from a jet of high-velocity material powered by the black hole, although this idea remains to be tested with future observations. "It's just such a cool discovery with such beautiful, early data that we can start to really piece out the differences between models," said Daryl Haggard, an astrophysicist at McGill University who has been using the orbiting Chandra X-ray Observatory to study the event. But the most revealing observations so far have been those that tracked the gradual dimming and reddening of the kilonova – precisely the rate of decline that would be expected if the explosion were powered by what nuclear physicists call the rapid neutron capture process, or r-process. "It actually follows the same decline you get for radioactive waste on Earth," said Anthony Piro, a member of the Carnegie team who is based in Pasadena. Images from the Swope and Magellan telescopes show the first optical evidence of the stars’ collision. In the first image from Aug. 17, the source of the gravitational waves is brighter; in the second, four days later, the source has faded significantly and changed to a reddish colour. This is not a coincidence. The observations appear to confirm that neutron star collisions are high-energy factories for creating and expelling atoms of gold, platinum, uranium and other heavy elements. By one estimate, said Harvard University astronomer Edo Berger, just the gold and platinum alone produced by the kilonova would weigh as much as 10 Earths. "Imagine this as you gaze at your jewellery," he said. Iris Dillmann, an experimental astrophysicist at the TRIUMF particle accelerator in British Columbia who conducts experiments aimed at studying the r-process said the observations revealed on Monday are "amazing," particularly because they show that neutron star collisions not only make heavy elements, but can also fling them out into space. "It's crucial to show how they distribute this material so that it can be incorporated into future generations of stars," she said. None of this would have been possible without LIGO's initial alert, which appears to have ushered in the long anticipated era of "multi-messenger astronomy" involving parallel modes of observation. While such efforts required unprecedented co-ordination and co-operation from thousands of astronomers in several countries, the organizational efforts clearly paid off this time around. "What is easy? No," Dr. Kalogera said. "Was it amazing? Yes!" 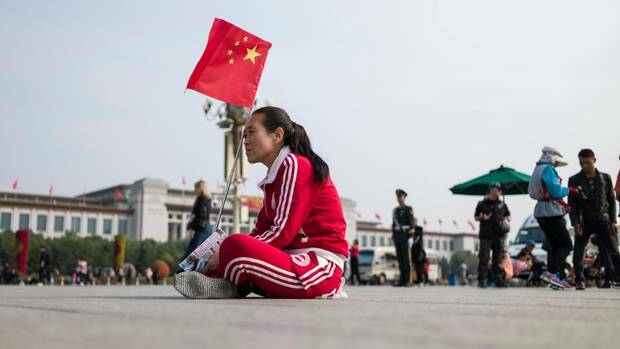 A looming scientific discovery prompts doomsday cheers among China’s gloomy youth The Chinese enjoy an upbeat economy and a growing presence on the world stage. So why does a new discovery in space science, and the rumoured prospect of the apocalypse, leave so many feeling cheerful? Nathan VanderKlippe investigates. 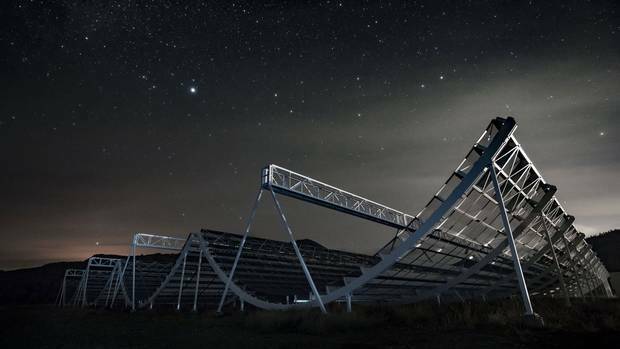 Sifting through the sounds of space with CHIME A radio telescope in B.C. is beginning to probe the heavens to see how our universe expanded and why, Ivan Semeniuk reports. 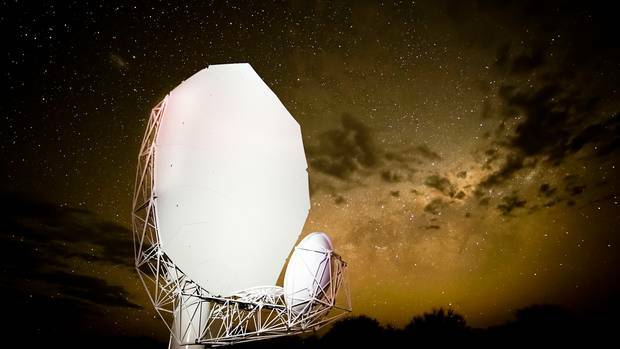 In a South African desert, telescope seeks clear skies in cruel terrain The Square Kilometre Array will be the world’s most powerful radio telescope, opening new frontiers in our understanding of the universe. But the builders have to contend with an unforgiving climate and other challenges first, Geoffrey York explains.